The storm with downtown Toronto in the distance. Photo posted by Amy Rensby. This rain will never stop, I thought, as water cascaded from my apartment window and fell from the sky at record pace. On July 8th, Toronto experienced the greatest amount of rainfall in a single day ever recorded in that city. A torrent of 126 millimetres of rain hit the ground, more than a whole month’s average for July. The storm flooded roads, transit infrastructure, and basements. Thousands went to bed that night without power. 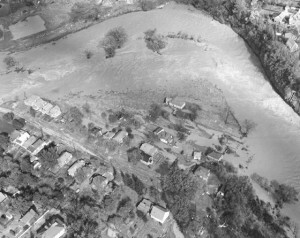 The impact of the flood would have been much worse if governments hadn’t acted following the aftermath of Hurricane Hazel, a tropical storm that hit Toronto in 1954. 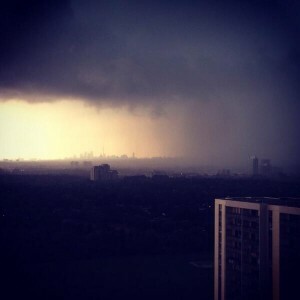 Yet the storm of 2013 also shows that Toronto’s urban environment is still susceptible to damage from flash floods, a phenomenon likely to become more common in upcoming decades. October 16th 1954 is a date that looms large in the urban environmental history of the Toronto region. A weather pattern travelling north from the Caribbean caused rampant flooding in Toronto, damaging homes, washing out bridges, and carrying cars downstream in its wake. The Globe and Mail reported that two rivers and two creeks had an additional flow of 65 billion gallons of water. 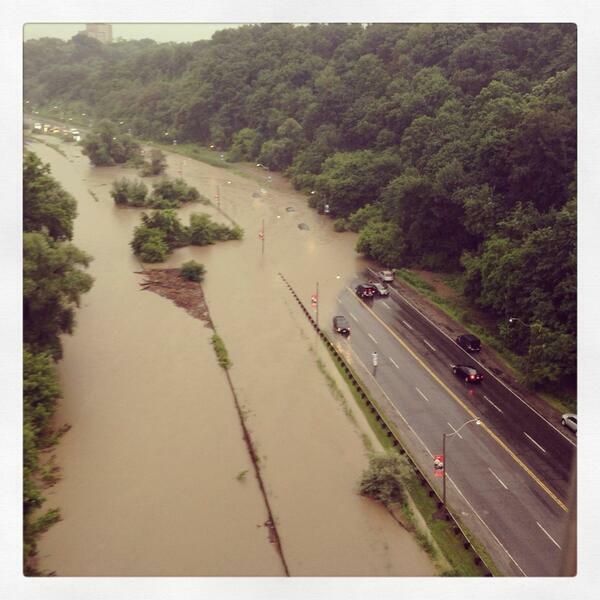 The worst damage hit the Humber River, just west of the City of Toronto. More than 500 homes were destroyed beyond repair. In all, 81 people across the region died from the consequences of the storm. One of the lasting legacies of Hurricane Hazel was the restriction on building in Toronto’s floodplains. In fact, a major reason the flood of July 2013 didn’t create more damage to life and property is that local governments converted former residential lands into parks and enacted zoning bylaws to ensure homes and other developments wouldn’t be built on lands at risk of severe flooding. Talk of doing so preceded Hazel, but local municipalities balked at the high cost. The storm gave impetus to enact such measures. For example, in the small lakeshore municipality of Long Branch (now part of the City of Toronto and previously part of the City of Etobicoke), local politicians took advantage of the destructive flooding of modest homes near the mouth of Etobicoke Creek to establish a waterfront park. After Hazel, the province agreed to pay most of the cost of expropriating private property owners in the area. The green space, now called Marie Curtis Park in honour of the town’s reeve at the time, witnessed high waters during the flood of 2013. There is more to the story. As historians Danielle Robinson and Ken Cruikshank uncover in their 2006 article published in the Journal of Canadian Studies, floodplain management forced local residents to make sacrifices. Damage from future storms was averted, but many homeowners complained that they wished to return to their homes or that compensation prices were too low. “Angry storm sewer” during July 8th flood. Photo by Robert Cerjanec. Other fragments of Toronto’s history emerged with the recent flood. Beneath the surface lay kilometres of pipes that make possible living in the city as we know it. But during the storm, the muted history of past decisions regarding Toronto’s hidden infrastructure came back with a vengeance. 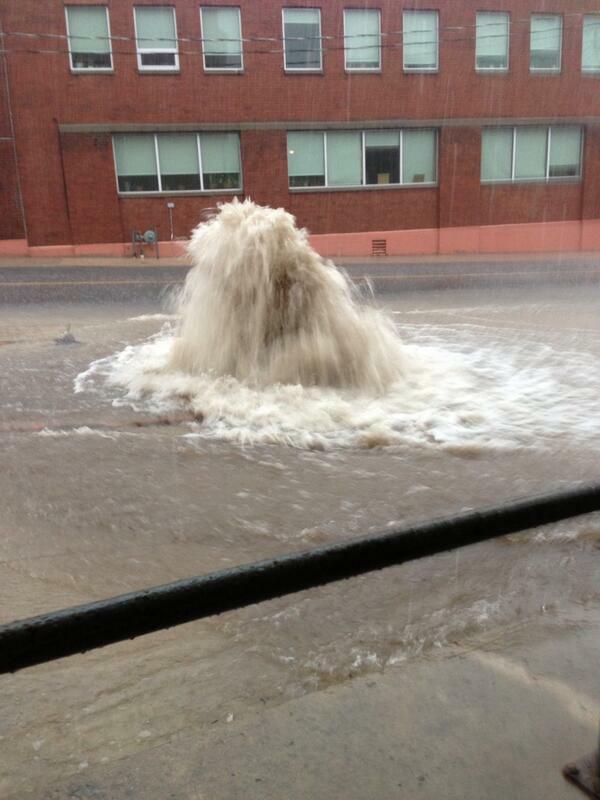 A widely retweeted picture of an erupting sewer on a flooded street during the storm illustrated in clear fashion the infrastructure under our feet. As I’ve written here in another post, urban dwellers often come in closest contact with the history of their city’s hidden infrastructure when its use is disrupted. That was certainly the case this past week. Torontonians also came face to face with the historic waterways that have been buried in sewer pipes since the late nineteenth century. Severe flooding occurred in areas such as Christie Pits, Trinity Bellwoods Park, and Bickford Park. 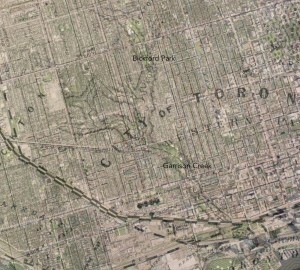 These green spaces are the remnants of Garrison Creek, one of the many “lost” rivers across Toronto. The city buried the creek in the 1880s. At the time, residents downstream complained for their health, as those living upstream used the waterway as an open sewer for their refuse. With the flash flood of 2013, these waterways awoke within their local geography and within the city’s consciousness. The river returned, you could say. As journalist Jesse Hirsh noted on twitter, “Garrison Creek returns.” Photo of Bickford Park by Eric Squair. Overlay of 1880 York County Atlas with contemporary satellite. Note Garrison Creek and Bickford Park. Waterways overflowing their banks created commuting chaos for thousands of residents. The rescue of hundreds of passengers stranded on a GO train from a Don River overflowing its banks emerged as one of the more dramatic scenes from the flood. This too, has a history. 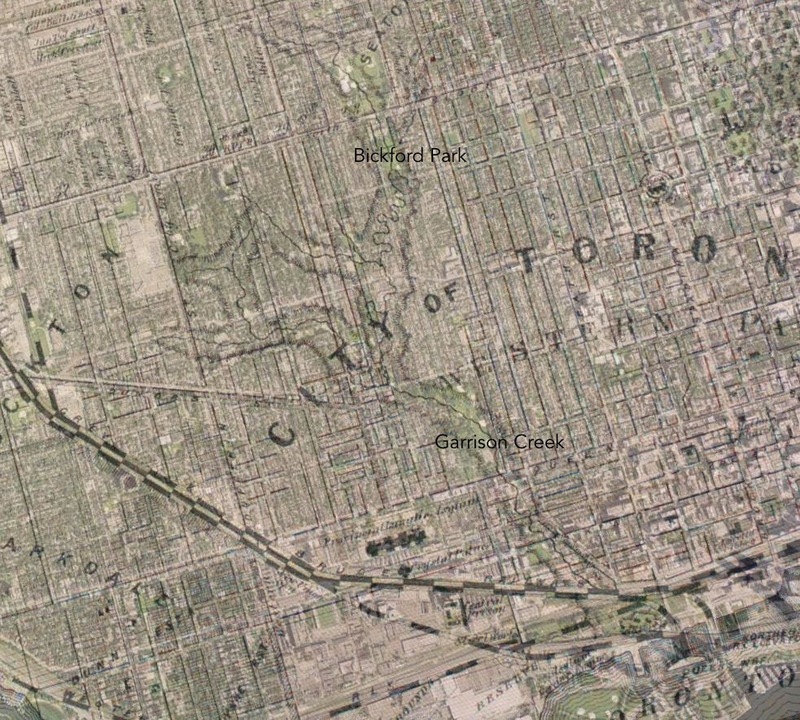 In Jennifer Bonnell’s PhD dissertation and upcoming book, she argues that people have thought about the Don River valley in different ways since the British settled the area during the late eighteenth century. In turn, these changing views have affected the use of space in one of Toronto’s most important physical landmarks. Bonnell argues that Torontonians began to see the Don valley as a putrid periphery by the latter half of the nineteenth century. Pollution from settlements upriver and industries along its banks had made the river a much less scenic site. In line with thinking of the industrial age, the river became a corridor for transportation and wastes. Railway lines first colonized the valley during the 1880s as part of the Don Improvement Project, which straightened the lower reaches of the river in the hopes of attracting industrial development and managing the common occurrence of flooding in the valley. A century later, the valley also became home to the Don Valley Parkway. Although Torontonians have started to rethink their relationship with the Don as a place of possibility over the past few decades, the passengers stranded on the GO train experienced the results of a chain of consequences dating back to the nineteenth century, when the valley became home to rail lines. The growth of impervious surfaces and deforestation in the region over the past century further contributed to the severity of the flood. In the nineteenth century, outsiders mocked Toronto as “Muddy York” – and historic photographs from the time illustrate some truth to the moniker. In an age of wooden sidewalks and primitive roads, Toronto could be a mucky place. Many factors – new paving technology, a yearning to be modern, the growth of automobile use (along with parking lots), and of course a wish for clean apparel – have led to a paved urban environment. 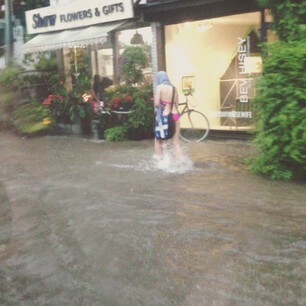 Flooding on Dundas Street at Shaw. Photo tweeted by @CHUMFM. But paving sacrifices the land’s ability to absorb water. In Toronto, asphalt and concrete surfaces force a greater volume of water to accumulate before making its way to Lake Ontario, rather than water being absorbed locally (like Hurricane Hazel, the porous surfaces that do exist were waterlogged from high rain levels hours earlier). Although the volume of water that fell on July 8th probably would have still caused discomfort to residents and damage to property, impervious surfaces increased the speed and volume of water rushing south towards the lake. Urban flooding was already on the minds of people in Toronto and across Canada – and its environmental historians (see here and here) – after the tremendous damage in the Calgary area this past month. A recent report commissioned by the City of Toronto predicted that climate change will lead to severe rainstorms becoming more common in the near future. Take one telling example: water from the recent storm closed the Don Valley Parkway for the second time in two months. If climate experts are correct, it may not be “the storm of the century,” but an early warning of many similar events. What lessons can we take from the flood, as those before us did with Hazel almost sixty years ago? While it is certainly impractical to permanently uncover all the buried waterways and tear up all the region’s paved surfaces, changes can be made in hopes of lessening the damage of future flooding. A recent CBC article tackled the issue. Sewers and other water-related infrastructure are in drastic need of replacement and improvement in much of urban Canada. These are “hard” pieces of engineering rooted in a conception of the city as a machine with physical inputs and outputs. The Federation of Canadian Municipalities reported in 2007 that up to $90 billion is required over the next decade to keep existing infrastructure in a working state. Other strategies based on a “soft engineering” approach are also needed in order to promote more local water absorption during times of high rainfall. These initiatives include implementing more green roofs, porous parking lots, tree plantings and, in less-developed land upstream, reservoirs on vacant land. Thanks to the actions of decision makers in the aftermath of Hazel, the flood of July 2013 wasn’t as severe as it might have been. The politicians of the time can be rightly criticized for some of their motivations and the treatment of those whose homes and properties were expropriated in the name of preventative flood plain management. But such actions probably saved lives this past week. Now is the time to work with the power of nature to reduce the impact of the next great storm on the city’s residents. These initiatives won’t come cheap, but they are a wise use of funds in the long run. Witnesses of the next flood will thank us. Bonnell, Jennifer Leigh. “Imagined Futures and Unintended Consequences: An Environmental History of Toronto’s Don River Valley. PhD dissertation. Ontario Institute for Studies in Education, University of Toronto, 2010. Reeves, Wayne and Christina Palassio, eds. HTO: Toronto’s Water from Lake Iroquois to Lost Rivers to Low-flow Toilets. Toronto: Coach House Books, 2008. Robinson, Danielle and Ken Cruikshank. “Hurricane Hazel: Disaster Relief, Politics, and Society in Canada, 1954-55.” Journal of Canadian Sudies 40, no. 1 (Winter 2006): 37-70. Sandberg, L. Anders, Stephen Bocking, Colin Coates, and Ken Cruickshank. Urban Explorations: Environmental Histories of the Toronto Region. Hamilton: L.R. Wilson Institute for Canadian History, 2013. Jay Young is a SSHRC Postdoctoral Fellow in the History Department at McMaster University. His research explores the historical intersections of technology, environments, and cities. Jay is currently revising his dissertation on the evolution of the Toronto subway system for publication, as well as starting new research projects on a history of urban garbage issues in Canada and an environmental history of downtowns in North America. This is a superb article that pulls together and synthesizes a lot of the literature on Toronto’s environmental history. For more, see Catherine Brace, “Public Works in the Canadian City: The Provision of Sewers in Toronto, 1870-1913” Urban History Review 23.2 (1995): 33-43. Sean – great point about the combined trunk sewer system in older parts of the city. Thanks for the additional article and reading the post too! On Friday night, July 19, Niagara Falls experienced its own version of a very heavy rainfall where numerous areas were flooded. Like in the Toronto storm the streets became temporary rivers as storm sewers could not carry away the rain water fast enough. One area in Niagara Falls that experienced flooding was the Valley Way area especially where a city pool and park are located (Niagara Falls Review, July 22 2013, page 3). Decades ago Muddy Run was a creek that followed the footprint of this current street. This natural drainage feature was also covered over many years ago.This river decided to reappear during the storm just like the “Lost Rivers” of Toronto. Your articles points out many of the causes for these recent floods. The point was well made to be aware of the negative impact paved and concrete covered areas cause when heavy rainfall occurs. This is another reason why people should be aware of the importance of green spaces in urban areas. Very smart and well written article. People often don´t realize that mother nature is unstoppable. I liked you mentioned the decisions that were made after the tropical storm Hazel hit the city because I didn´t know much about it until this year´s floods which occurred in Toronto. Even though I was a witness of how Toronto´s streets became rivers I´m not sure if something´s going to change in the infrastructures of sewers in the town. As people we should be very cautious about similar events because I don´t believe this year´s tragedy was the last one. It is important to focus on the quantifiable causes of flood incidents (operational decisions, development impacts, limited design standards from 100 years ago) if we are to develop evidence-based policies to mitigate risks. So green infrastructure is emerging as an overpriced panacea for water management (it has some of the same limitations of Ontario green energy strategy implementation, as highlighted by the Ontario Society of Professional Engineers – i.e., inadequate planning and financial analysis). This is perhaps why the Ontario government is suggesting that “excessive costs will not be a constraint” for green infrastructure implementation in new draft policies.